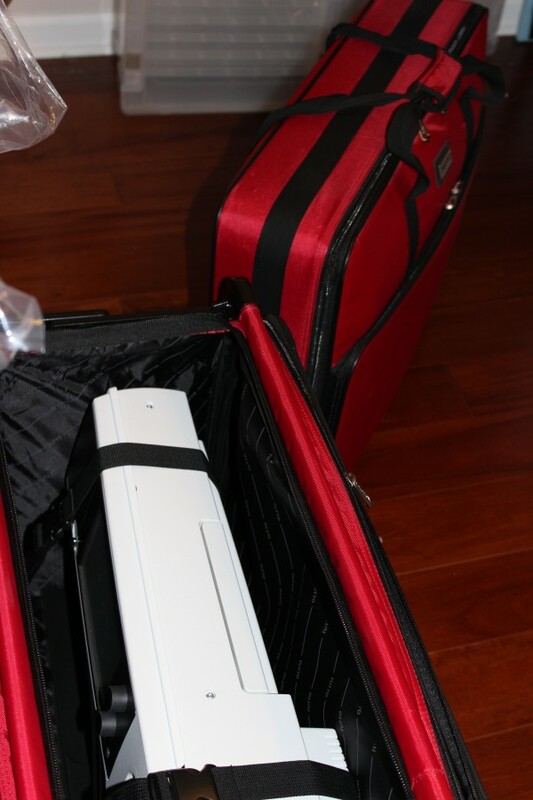 Machine and embroidery unit packed and ready for trip to Atlanta. This past week I continued to research with the help of a trusty yahoo group the issue with my sewing machine/computer to no avail, I lugged it to Atlanta and was able to sit with a machine pro who watched what I was doing and we eventually figured out that I had the incorrect foot on to perform the hoop calibration, ( it was not specified in the procedure). And since I was there, we went over several items that I needed a refresher course on including the software that I am using to digitize a quilt design. Therefore the trip was not wasted and I even received complimentary tickets for the carload of people I am driving to Atlanta’s sewing and quilt expo next week. We reviewed how to calibrate and make buttonholes, oiling the machine and some other items that I had forgotten in the two years since I brought the machine home. It ended up being educational, I then zipped home to take Maggie for a long walk as she is no longer used to being alone for such a long period of time. Fair Isle Knitting, wrong side showing the carrying of yarn across the back. 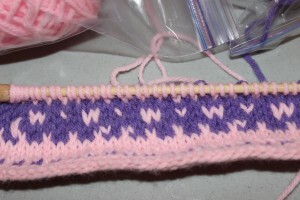 I also, took the Fair Isle knitting class which was a great intro, and started today making the gauge swatch. I learned a great way to swatch when you are knitting in the round from Craftsy, reminiscent of the fair isle class in that using double-pointed needles you bring the yarn to the other end, looping without catching it, as you do in the above picture and just knit from both ends not catching it for big loops and better tension. This gives a better gauge swatch when you are knitting in the round as the knitting tension is more closely related than purling back in a stockinette stitch. 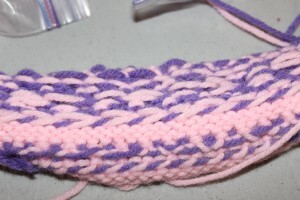 A neat idea, and one I was trying to figure out this morning when I decided to check the Craftsy classes I am enrolled in. The Knitting in the Round Lab had the answer. I am excited because we have a finish carpenter visiting tomorrow to help us figure out better space utilization. I would love to have my sewing studio in a useable state. This has not been the case for a while and only more complicated with the water issue over the summer. I am keeping my fingers crossed that we can come up with some workable solutions. As this is tax time, I have spent an inordinate amount of time trying to tame paperwork of which I ignored too long. So my nose has been to the grindstone over this past week trying to establish some semblance of order. Taxes have to be done and paperwork has to be in the correct files to more easily do it. Today, I actually saw my cutting table’s surface for the first time since August. This consumes my needling time and I want it done! Therefore, I have not completed anything just done some minor steps each day to move forward. Slow steps, but forward progress, nevertheless. Almond trees are budding, our neighbor’s apple trees are as well so the balmy weather of spring approaches. Until next week, sew on!